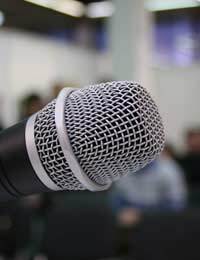 Public speaking can be a challenge in and of itself; but what happens when you’re asked to talk about a topic you don’t know well? Initially it’s extremely helpful to get clarification on the subject matter from whoever is asking you to give the presentation, especially if he or she is aware that you are not comfortable with the topic. For instance, if your supervisor has requested that you provide shareholders or colleagues with a speech about your new corporate marketing initiatives (but you’re from the accounting department), it’s critical to obtain a clearer understanding of what’s anticipated of you. By gathering as much upfront information on the expectations regarding your talk, you can start off on the right track. Otherwise, you might waste quite a bit of time preparing a speech that doesn’t cover the proper materials. After you have a better understanding of what you’re expected to talk about, how long your speech will be, and who will be in attendance, it’s time to go into research action. Spend significant amounts of time researching your subject, using every available resource you can find. However, be careful during the investigative phase of your planning. Double check all facts before assuming they are true (and if they come from Internet sources, you might want to triple-check them—misinformation and incorrect or outdated statistical evidence abounds in cyber space.) Collect more than enough data or anecdotes to more than fill your speech. And be efficient about your fact gathering; you shouldn’t be forced to write your speech at the last minute because you took too long obtaining data. Unless you’re giving a half-day or all-day talk, you can usually focus on only three main points during the body of your speech, which will make the presentation easier. Be certain these are the most important topic “angles” you discovered while you were investigating rather than just interesting (but essentially unimportant) factoids. The next generation of marketing initiatives that are already “in the works”. Using these fairly simple areas as guides, it will be relatively easier for you to plug in impressive, factual, and/or compelling data than if you tried to tell your audience everything you discovered during your research. Though most speech makers do not over-rehearse, it can happen. So the night before you’re due to publicly talk, don’t spend the evening practicing twelve times, winding up in bed at 3:00 a.m. when you have to arise at 6:00 a.m.! Instead, rehearse once or twice, then shelve your talk, and do something you enjoy. Talk a walk with your family. Read a fabulous book. Listen to your favourite music. Engaging in soothing activities will help you unwind and relax; doing so will also increase your chances of getting a good night’s sleep so you aren’t forced to give your talk in a sleep-deprived fog. When the day of your speech finally arrives, you can be confident in the knowledge that you’ve done all you possibly could to make your presentation of value. Best of all, you’ll know much more about a topic you previously did not… and education is always beneficial. Quite simply, if you have to speak about something you don't know, keep it as brief as possible. People can detect waffle a mile away, especially if they know the topic better than you do. There's no way you can sustain a half or whole day that way. Keep it short, stick to facts and only speculate if you have some developed ideas you can back up. Try and do it differently and you'll simply end up looking foolish ion front of everyone.